Use this FAQ page and emails sent by CNC4x4’s URE work day coordinator to answer questions you might have about the work day. This FAQ is recommended for new members, guests, or long-time CNC4x4 members who haven’t been to a URE work day in a while. Contact Mike Feltman (felt3451(at)gmail.com) if you need more information. When are the URE Work Days? Formally scheduled URE work days are usually on the 3rd or 4th Saturday of every month , except December. Weather factors may cause a work day to be rescheduled for a different Saturday. Actual work day dates are shown on CNC4x4’s calendar and on emails sent out by CNC4x4 just prior to the work day. Watch for updates and cancellations via email. If you can’t make it to a particular work day, there’s usually another one the following month. There will be coordinators there to help organize the work, but they might not be CNC4x4 members. Last but not least, you can also create your own work day at any time. See details below. How Do I Let the Club Know I’m Going to Attend? It’s not necessary, but you are welcome to reply to a work day information email from CNC4x4. It may be handy to know who else from CNC4x4 is planning on attending. Please state if you’ll need a ride or if you’ll have seats available for those who might need a ride. For some work days where a large CNC4x4 attendance is expected, we will start a new thread on CNC4x4’s ‘Members Only’ forum. Again, you will be notified by email when and if a new thread is started. What specifically will we do? future maintenance item cataloging…This involved riding all the trails, identifying things that need doing, recording text notes, GPS coordinates and a picture of the location. Are There Attendance Sheets and Liability Waivers? Yes, and it can get a little complicated b/c 1) there are forms for the Forest Service and forms for CNC4x4, and 2) some work days have CNC4x4 coordinators and some don’t. When there is a CNC4x4’s work day coordinator present, he or she will help you with the details. CNC4x4’s work day coordinator will bring several blank CNC4x4 liability waivers, several blank new member application forms, and a recent copy of the club’s membership list. If there is no CNC4x4 work day coordinator present, there will be a non-CNC4x4 work day coordinator who will help you find the US Forest Service forms you’ll need to sign. Each participant will sign in on a US Forest Service attendance sheet. If a CNC4x4 work day coordinator is present, they will be on hand to identify the US Forest Service coordinator if there are questions about who needs to sign the US Forest Service volunteer form and waiver. The US Forest Service attendance sheet will be used to ensure the Forest Service gets credit for us being there and to ensure the Forest Service is aware of our level of commitment. For some work days, participants may be asked to record the tools they brought with them. If there is a CNC4x4 work day coordinator, they will use the club’s current membership list provided by CNC4x4’s secretary to confirm that each CNC4X4 member present has a CNC4x4 liability waiver on file. This will apply also to the family of the CNC4x4 member whose names may appear on the member’s CNC4x4 liability waiver. If the CNC4x4 member list does not indicate that a particular member has a signed liability waiver on file, the member must sign one before participating in the work day. Here’s a link to a blank copy of the liability waiver. CNC4x4’s work day coordinator will ensure that each guest riding with a CNC4x4 member signs a CNC4x4 liability waiver if the member is not certain that the guest has signed a previous waiver. Following the work day, the CNC4x4 work day coordinator delivers new signed waivers to the club secretary for storage. If there is a CNC4x4’s work day coordinator, they will create an official club attendance list and keep track of the hours worked. If you don’t actually see the coordinator write your name on the attendance list, please catch their attention. CNC4x4’s work day coordinator will send the completed attendance list to CNC4x4’s secretary. If no CNC4x4 work day coordinator is present, each CNC4x4 participant should let CNC4x4 know they participated by sending an email report to CNC-4×4 (at) googlegroups.com . What Are Some of the Other Benefits of Participating? Volunteers using their own rigs on the trails will be given a trail pass during the morning sign-in so they won’t have to buy a trail pass for the day. If you intend to camp at one of URE’s campgrounds that weekend and you participate in the work day activities, your camp site is free. See ‘What About Camping?’ below. During winter months the trails are closed to the public….but are open to volunteers during work days to get to the work sites. Some say this is the best way to experience URE off road trails. CNC4x4 BOD members must attend at least one URE Work Day per year. Often somebody needs a ride and somebody always has an available seat. I don’t think we ever had anyone NOT attend because they couldn’t find a ride. If a group is going to carpool or convoy, they must arrange it themselves. We’ll use email and sometimes use CNC4x4 Members Only Forum threads just to help attendees contact one another, then please take it off-line to finalize your travel plans. As of 6/16/18, tools brought by volunteers are no longer recorded by the USFS. Please bring the tools anyway. The information below (recording tools brought) is still shown here for archival purposes only. The USFS may restart the practice at any time. ==begin archived section====The Forest Service sometimes gets credit for tools brought by club members whether the tools are used or not. In a quirk of the rule, even though chainsaws generally cannot be used except by a very few members who have official Forest Service chain saw certification, the Forest Service does get credit if you bring chain saw(s) whether they are used or not. Tip: If you bring one, be prepared to let a certified chain saw person use it. With the exception of chainsaws, don’t bother bringing other tools with an “on-off” switch, e.g. gas augers, chipper-shredders, etc. The Forest Service provides that type of equipment when needed. Shovels, hoes, rakes, any kind of digging tool can be brought and credit is often received for those as well. Spring lever “grabbers” are particularly useful for picking up trash along the trail. If there is no one officially recording the equipment you bring, please email the information to Mike Feltman (felt3451 (at) gmail.com) after the work day. If you’re going to take your rig on the trails, arrive early enough to gas up and air down. Gas can be purchased at the Eldorado Outpost. Lines can get pretty long there at that hour of the morning. Volunteers using their own rigs on the trails will be given a trail pass during the morning sign-in so they won’t have to buy a trail pass for the day. No Alcohol. Everything else is typically your responsibility. Normally the club does not subsidize or provide food for URE work days unless it has been arranged and approved in advance by the club’s BOD. Club members typically bring their own food and drink for a light lunch on the trails. Additional items can be purchased at the Eldorado Outpost or other area businesses if you arrive early enough. We typically take a lunch break wherever we are on the trail. Sometimes the group will decide to stop and have dinner somewhere on the way home but that is typically decided on the spot. If you intend to take your rig on the trails to get to the work sites, bring all those things you would normally bring on a trail ride, for example, CB radio, safety equipment, fire extinguisher, and your own first aid kit. Consider bringing protective items for sun, biting/stinging insects, etc. What If It’s Too Hot, Too Cold, Too Wet? We’ve been told that the Forest Service doesn’t want volunteers out there when the conditions are especially uncomfortable. The Forest Service and our club understand you are volunteering. No one will intentionally put you in a dangerous situation or in one that is too uncomfortable. Do your part by dressing appropriately for the expected weather and please don’t do something you’re not comfortable doing. How Can We Communicate Any Last Minute Questions/Answers/Issues? There is no official contact phone number on the day of the event. CNC4x4’s work day coordinator may or may not choose to post their cell phone number. CNC4x4’s work day coordinator may check the email list early on the morning of the event and try to resolve issues. You may share whatever contact information you wish with the club members, but please be aware that cell phones may be reliable in some areas (e.g. Hunt Camp) but not in all areas all the time. CBs might or might not work. What About Transportation from Hunt Camp to Specific Work Sites? I wouldn’t want to take my un-lifted, 32” tired, 10” ground clearance JK over many of the difficult obstacles URE has to offer. The good news is that all the work site locations can be reached by a stock JK or similar vehicle. If a particular task is at a particularly difficult obstacle like the wall on the Daniel trail, you can approach the obstacle from a relatively easy direction and park your rig close by. If you decide at the last minute you don’t want to take your rig on the trail, there is usually another club member around with a vacant seat. Generally speaking, our club members do not camp for work days. It is typically just a daytrip. If there is no specific CNC4x4 point of contact for the work day, please send an email with your camping details to Terry Savery (US Forest Service ranger at URE) tsavery (at) fs.fed.us and await her reply. IMPORTANT: Especially during the Summer season, the assignment of camp site number(s) can change at a moments notice. For this reason, the CNC4x4 point of contact for the work day should make every attempt to use group text messaging to communicate such changes. Email doesn’t have the immediacy of text messaging. All the more reason to provide a cell phone number. Is There a Liaison Between our Club and the US Forest Service? It’s somewhat informal, but in the past one of the rangers (Terry Savery) has sent an email to some of our members. Those members forward such emails to CNC4x4’s work day coordinator who will forward the information to you. I can’t make it to any scheduled work day. Can I still volunteer to help? Where Can I Find a URE Trail Map? The most recent map we know about is right here, dated August 2, 2017. Warning: Maps have a hard time keeping up with the changes to the trail system. It’s not a bad idea to compare your map with others, and compare again with folks having first hand local knowledge. Don’t rely on ONLY a printed map to keep you from getting lost or from going down a trail that was recently closed or re-routed. There is a thread at NC4x4.com where maps are posted– follow this link to the last page for most current posts. Also, Eldorado Output usually has free URE trail maps. Just ask the person behind the cash register. While the information emails from CNC4x4’s work day coordinator will provide you with everything you need to successfully participate, there are other forums and sites that provide the same or similar information. 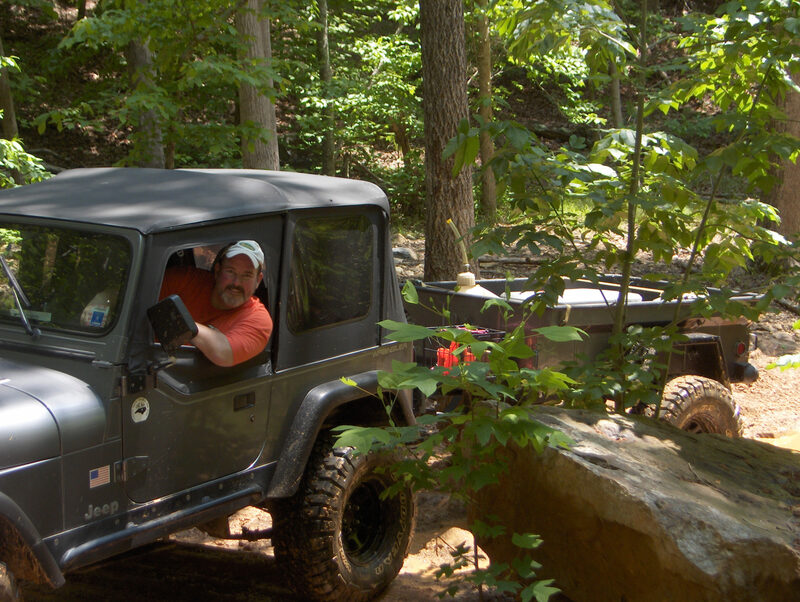 For example, information that is posted on NC4x4’s forum is typically for volunteers who aren’t part of a club. CNC4x4 does not rely on that forum for information. Also, not all CNC4x4 club members read NC4x4’s forum so the information emails from CNC4x4’s work day coordinator is still the best source. Please help us keep it accurate. If something is missing or wrong on the email, please reply to CNC-4×4(at)googlegroups.com. Although subject to change, some of the Forest Service workers and coordinators post work day updates on this NC4x4 forum. You’ll have to search for ‘work day’ and add the year and month in the search box to narrow it down to the upcoming work day. Some of the postings are very specific regarding work tasks. The email from CNC4x4’s work day coordinator is still the best place to find out about tasks and meals…BTW, if nothing is said about meals, you’re on your own. This is a look-up table with links to all the campgrounds in URE. Each of the four URE campgrounds has a separate web page with detailed information about that specific campground. This site is focused on recruiting new FOU members and paying for FOU membership. As of today, there is no information about work days, but I’ve included this link for our club members who might want to join FOU.